Cite page (MLA): "Collaborating Institutions." Livingstone Online. Adrian S. Wisnicki and Megan Ward, dirs. University of Maryland Libraries, 2018. Web. http://livingstoneonline.org/uuid/node/77d30e4e-f5dd-4ec0-a619-a8eb85d9b4f4. This page cites the libraries, museums, archives, and universities that support the work of Livingstone Online. The success and continuing development of Livingstone Online relies on our collaboration with an international range of libraries, museums, archives, and universities. 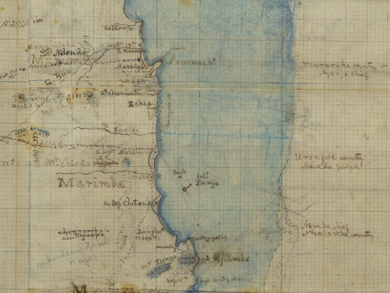 These institutions have not only made their Livingstone manuscripts available to us (and so to our users), but in many instances have provided pro bono services, technical advice, and other forms of support. We are grateful for this assistance. Our work would not be possible without it. Wooden casket containing the Freedom of City of London conferred on David Livingstone, detail, c.1857. Copyright David Livingstone Centre and Roddy Simpson. Object images used by permission. May not be reproduced without the express written consent of the National Trust for Scotland, on behalf of the Scottish National Memorial to David Livingstone Trust (David Livingstone Centre). The list below cites the institutions with which we collaborate. Clicking on any of the names in the list will take you to the home page of the given institution. Elsewhere on our site, users also have the option of exploring Livingstone's manuscripts by institution.